These are my Coffee Macarons! 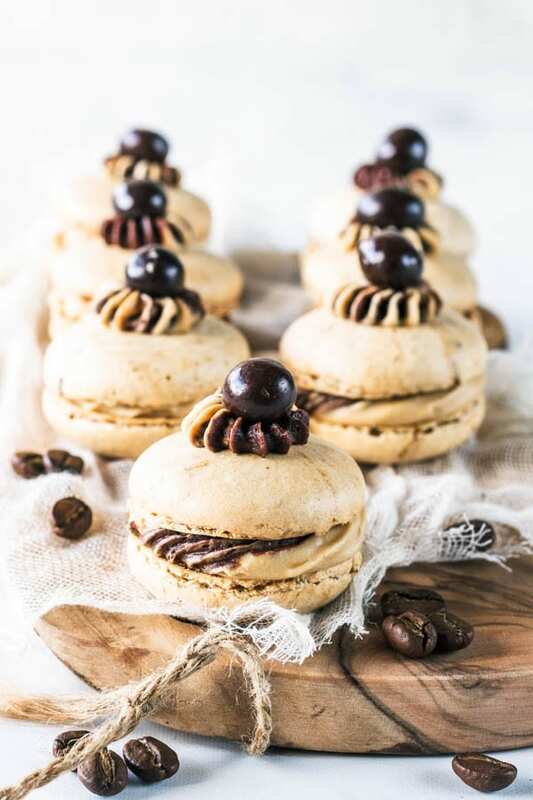 They feature a beautiful swirled filling of Chocolate Frosting and Coffee Cream Cheese Frosting, and are topped with a chocolate covered espresso bean. 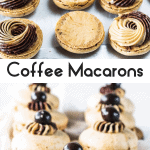 I used these Coffee Macarons to top my Mocha Cupcakes, and I also made mini Coffee Macarons to top my second version of Mocha Cupcakes. 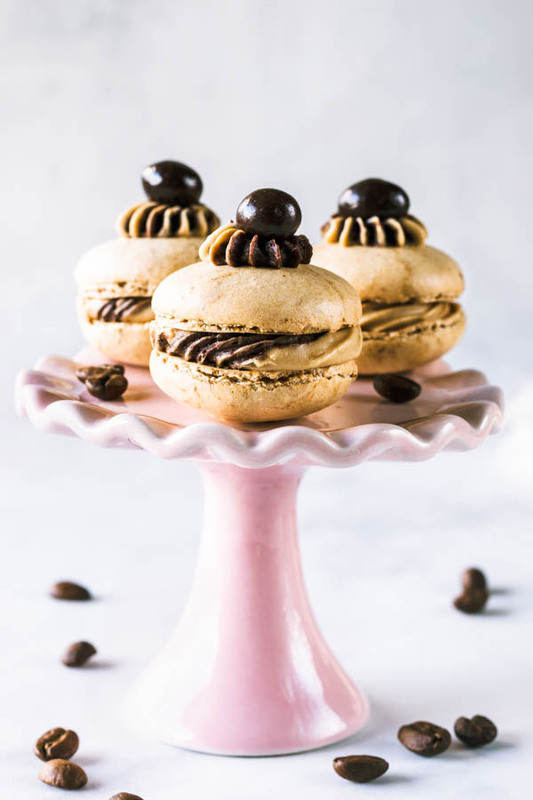 I’ve made Coffee Macarons before with Coffee Buttercream frosting as a filling, but I have to say I prefer the Coffee Cream Cheese Frosting so much more. Man, I just looooove cream cheese based frostings. They’re my favorite taste wise. For decorating, I prefer Swiss Meringue Buttercream. So, let’s keep talking about the filling. Fit a piping bag with the piping tip of choice. Set aside. Lay out a piece of plastic wrap on top of the counter. Spread a stripe of the Chocolate Frosting in the middle of the plastic wrap, across the narrow side. On top of the Chocolate Frosting, spread out an equal amount of Coffee Frosting. Roll the plastic wrap over itself to form a log, a frosting log if you will. Insert the log in the piping bag. Start to pipe your swirled frosting away. Make sure both frostings have similar consistencies. Because otherwise, one of the frostings will rush down the piping tip and out of the bag, while the other will stay at the top. For that, you must have your butter and cream cheese just softened, don’t use overly softened butter or cream cheese for any of the frostings. Make sure to use an equal amount of each frosting. It helps to spread the frosting all the way to the edge of the plastic wrap, so this way, you won’t have plastic wrap excess getting in the way when you are piping the frosting. Sometimes if there is excess plastic wrap, it may interfere with the frosting flow, and one of the frostings might not come out alright. Remember you want both frostings to come together out of the piping bag at the same time. 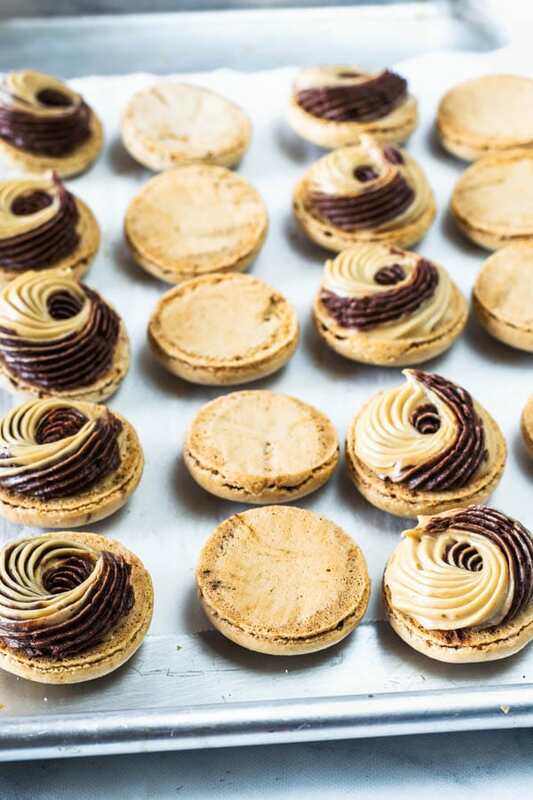 To pipe the filling on my Coffee Macarons, I used a #32 Wilton open star tip . If you like this swirled frosting technique, I’ve also used it here in my Blueberry Macarons, my Chocolate Pumpkin Cupcakes, and my Strawberry Lemonade Cupcakes. This is the perfect treat for people who love coffee. I adore coffee desserts, well and even just coffee in general. If I can have my coffee and eat it too, specially if there is chocolate involved also, then I’m in heaven. Perfect combination. Also, these Coffee Macarons were part of my Macaron Marathon I talked about on my Pistachio Macarons post. Last week I made 7 different macaron flavors, which equals 364 shells, 182 assembled macarons. Coffee Macaron was one of the flavors. 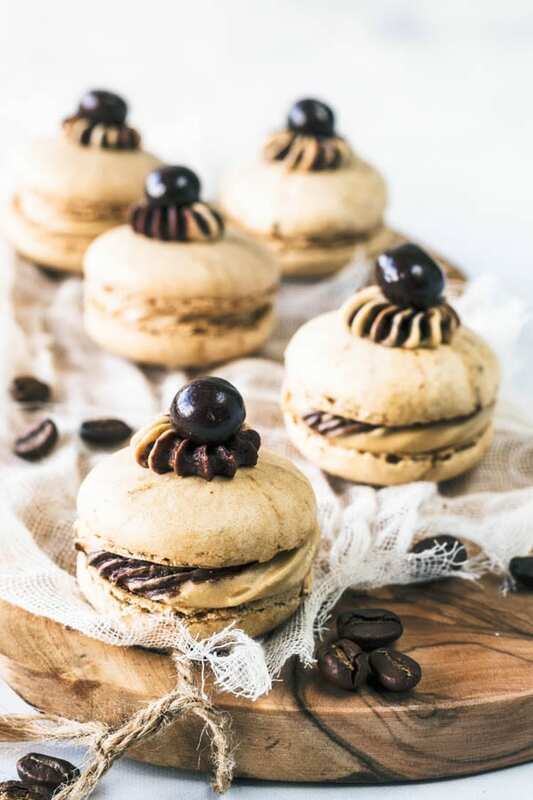 More Coffee Desserts: Espresso Chocolate and Peanut Butter Cupcakes, Espresso Chocolate Scones, Espresso and Peanut Butter Macarons. 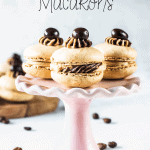 More Macaron Flavors: Tiramisu Macarons, Salted Caramel Macarons, Pumpkin Macarons. Trending desserts on the blog the past week: Flan Cake, Bavarian Cream Donuts, Lindt Truffle Chocolate Cupcakes. As always, thank you so much for reading and for all the support from this amazing community of bakers and bloggers! 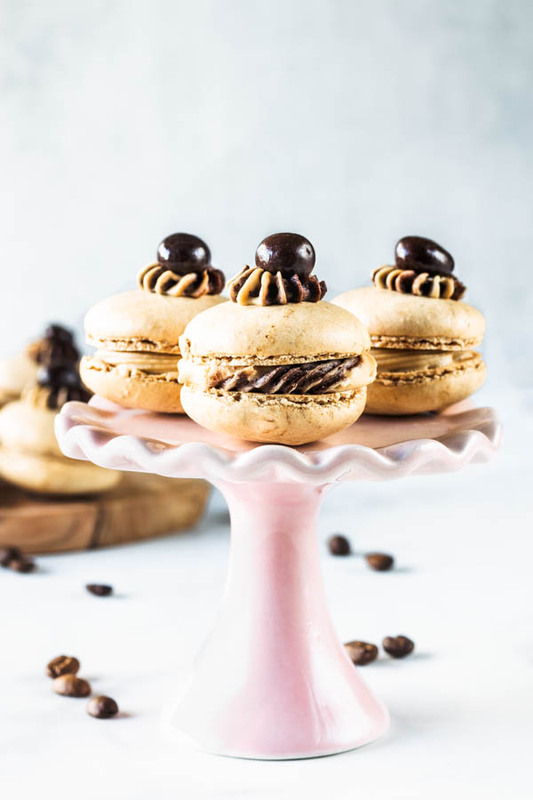 These Coffee Macarons are filled with a coffee and chocolate frosting swirl. Topped with a chocolate covered espresso bean. At this point, you want to add the espresso powder. Make sure to add right at the end. Stir just enough to combine, about 3 folds. Start by sifting the powdered sugar. Set it aside. Now, cream the softened cream cheese and butter together in the bowl of an electric mixer, for about 2 minutes, until light and fluffy. Add Kahlua, or vanilla extract. Mix to combine. With the mixer off, add powdered sugar mixture to the bowl. Turn mixer on low to incorporate the powdered sugar with the cream cheese and butter. Once you see no streaks of dry powdered sugar, cream mixture on medium high for one minute. At the very end, add espresso powder and stir to combine. This frosting will store well in the fridge for up to 5 days, covered. Make sure to always leave your frosting covered. Cover the bowl with a lid or plastic wrap, because otherwise, the surface will dry out and get hard. Sift the powdered sugar, and cocoa powder. Sit aside. Cream butter in the mixer until creamy. Add powdered sugar and cocoa powder, and mix to combine. Once dry ingredients are incorporated into the butter, increase speed and cream until smooth. Add Kahlua, or vanilla. Add milk if necessary. If mixture is too thick, add 1 teaspoon of milk at a time, until you obtain the desired consistency. If mixture is too runny, add a bit of sifted powdered sugar until you obtain a smooth and spreadable frosting. Lay out a piece of plastic wrap. Spread a stripe of the Chocolate Frosting in the middle of the plastic wrap, across the narrow side. 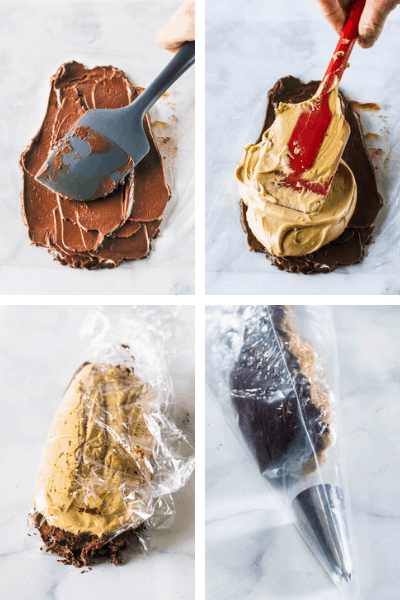 On top of the chocolate frosting, spread some coffee frosting. Roll the plastic wrap over itself to form a log. Pipe about 1 teaspoon of filling on top of each bottom shell. Top with the top shell. I piped a little frosting decoration on top of each macaron, and then put a chocolate covered espresso bean on top. 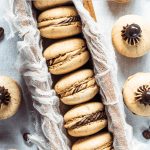 Store macarons in the fridge, in an air tight container for up to 5 days, and in the freezer for about 1 month. 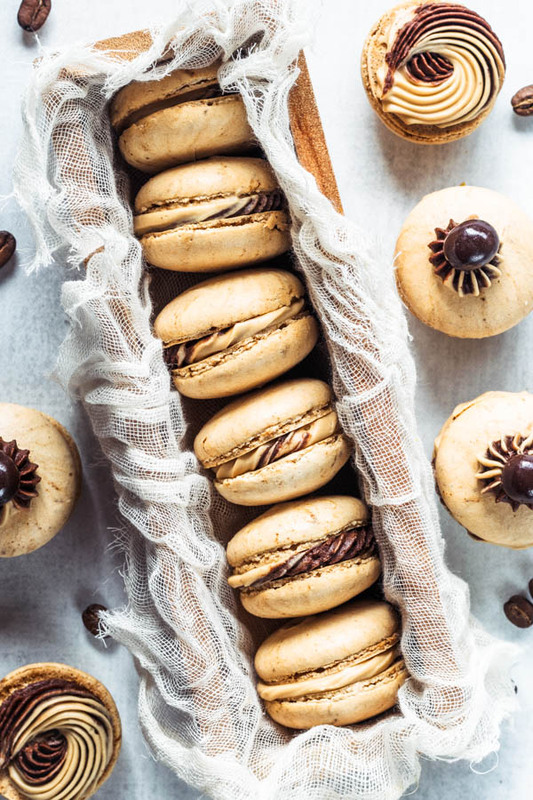 I love coffee macarons! These look perfect! The swirled icing is very interesting and the icing on top makes it all the more interesting 😉 I haven’t tried this yet but I like the idea.